Show your team and school spirit with this mega can cooler with your favorite NFL team or Collegiate School name. Perfect for tailgating, outdoor concerts, day at the beach and more. 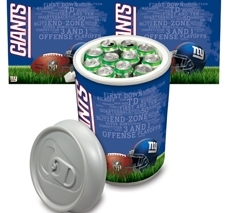 NFL team logoed Mega can cooler features a durable insulated construction that is designed in the shape of an oversized beverage can. Fun and functional, this can cooler holds up to 27 standard size cans, and the hard plastic construction allows for converting this cooler into a seat. The lid is removable, and the handle will fold to either side. This durable cooler measures 12-1/4 inches in diameter and 20-3/4 inches high, with a 5 gallon capacity.